Idaho teacher salaries increased by an average of 3.6 percent in 2017-18, the third year of the state’s five-year, $250 million plan to boost teacher pay. And that’s the largest increase since the passage of the 2015 “career ladder” salary law, according to an Idaho Education News analysis of State Department of Education data. From a numbers aspect, the career ladder is performing as advertised. It has boosted starting teacher salaries and has provided raises for teachers at the low end of the salary scale. But it’s too early to tell whether the career ladder is meeting its main objective. The extra money is supposed to help school districts and charter schools recruit teachers, and keep experienced and talented educators in the classroom. Here, the evidence is anecdotal, and the evidence of a statewide teacher shortage is rampant. Still, the career ladder appears politically popular. The 2018 Legislature will have to decide whether to fund year four, at a cost of $41.7 million — but previous installments have sailed through the Statehouse with bipartisan support. In order to calculate average teacher salaries, Idaho Education News compared two sets of numbers from the SDE: the amount of money school districts and charters pay their instructional staff, and the schools’ teacher staffing numbers. This year, Idaho’s average teacher salary reached $48,113, up from $46,439 in 2016-17. Since the launch of the career ladder in 2015, the average salary has increased by 8.8 percent, or $3,908. Salaries continue to vary widely among districts and charters. Blaine County pays an average salary of $72,894 — almost 52 percent above the state average. Fifty districts and charters pay an average salary of less than $43,000 — more than 10 percent below the state average. Calculating average salaries is not necessarily an exact science. Two school administrators, contacted for this story, questioned the accuracy of the data provided by the SDE. Still, when the salary numbers are spread across a large sample, the state’s 16,370 full-time teaching positions, one important pattern emerges. Teacher pay has increased steadily over the three years of the career ladder law — by 2 percent in 2015-16, by 2.9 percent in 2016-17, by 3.6 percent in 2017-18. The influx of state dollars has meant different things in different communities. In close to half of the state’s districts and charters, the average salary is up more than 10 percent since the advent of the career ladder. But while Blaine County’s salaries remain highest in the state, the average salary is up only 1.7 percent since 2015. The state career ladder dollars have had little impact, spokeswoman Heather Crocker said, and the upscale district still relies heavily on its unique legal authority to collect local property tax levies. Meanwhile, schools have long approached the career ladder law differently. Some have adopted the salary schedules in the 2015 law. But that’s optional, and some schools have opted to fold the state’s dollars into their old salary plans. For the schools that adopted the new salary schedule, change hasn’t always been easy. The transition has sometimes been “confusing,” said Katie Allison, executive director of iSucceed Virtual High School, but she likes the fact that the career ladder helps her school prioritize teacher pay. Teacher recruiting. The Twin Falls School District faces some built-in recruiting challenges. The nearest college of education is two hours away, and most Treasure Valley graduates can find teaching jobs in the area. In order to draw teachers in, Twin Falls wants to offer the highest salaries in south-central Idaho, save for Blaine County. Enter the career ladder. “It certainly hasn’t hurt,” Superintendent Brady Dickinson said. But even so, Twin Falls has been forced to hire unlicensed teachers or hire through alternative teacher certifications — a growing trend across Idaho, as schools grapple with a pervasive teacher shortage. Teacher retention. The Nampa School District has long struggled with turnover, as teachers can leave for better-paying jobs in neighboring districts. Nampa’s average salary still lags behind the West Ada, Boise, Kuna and Vallivue districts, but Nampa’s average salary is up 12.9 percent from 2015. This means the district spends less time recruiting and training teachers. “Our lower turnover rate today equates to a more experienced teaching staff,” spokeswoman Kathleen Tuck said. But some turnover is unavoidable. Dickinson says Twin Falls loses some teachers who follow spouses to out-of-state jobs, and there’s nothing the career ladder can do to stop that. Meanwhile, it’s unclear whether the career ladder will keep experienced teachers in Idaho, when they can cross the state line for a pay raise. According to the National Education Association, Idaho’s average teacher salary ranked No. 47 in the nation in 2016, one year into the career ladder rollout. Idaho moved up one spot in this ranking — but Idaho still lags behind all of its neighbors. Contract negotiations. In Nampa, district and union negotiators were able to hammer out a deal for 2017-18 by mid-May, well before the July 1 start of the budget year. Tuck attributes this to the career ladder, which gives the district a clear sense of how much money it can offer teachers. A few miles to the east, in the West Ada School District, contract negotiations have gone to mediation for three successive years. This year, average teacher salaries in West Ada are up by 5.6 percent. That bottom line number didn’t change much during the negotiations process, spokesman Eric Exline said. Now he hopes the district and union negotiators have reached a common understanding; in 2017, as before, the district’s salary offer reflects state career ladder funding. “We just passed through the money that we got,” he said. State superintendent Sherri Ybarra made year four of the career ladder a centerpiece of her 2018-19 budget proposal. Ybarra says there is evidence, however anecdotal, that the career ladder is helping schools recruit and retain teachers. But when she spoke to the Senate Education Committee Monday, she called the teacher shortage a “crisis” that the career ladder alone will not solve. There is no shortage of ideas about next steps. During that same Senate Education meeting, lobbyist Harold Ott floated a familiar idea on behalf of his clients, the Idaho Association of School Administrators and Idaho Rural Schools. He said a student loan forgiveness program would help small-town schools hire teachers. Democratic Reps. Paulette Jordan of Plummer and Sally Toone of Gooding proposed a loan forgiveness bill in 2017, but it didn’t get a hearing. Loan forgiveness could help get entry-level teachers into the classroom. But many education leaders say Idaho will need to do more to keep veteran teachers in the classroom. The career ladder frontloads state dollars into beginning teacher salaries — not the top end of the pay scale. That leaves districts and charters scrambling for money, or other inducements, to keep their most experienced teachers on board. 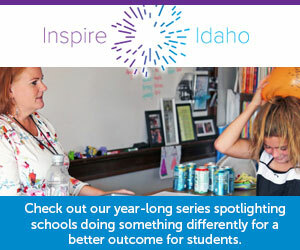 “Our most experienced and valuable teachers have been largely overlooked under the career ladder,” Idaho Education Association president Kari Overall said last week. In lieu of a $60,000 salary cap, Idaho will provide “master educator premiums” of up to $4,000 a year to teachers who take on leadership roles. The program will start in 2019. The State Board of Education has said there will be no cap on the premium program. But Dickinson is hearing “anxiety” within his ranks. He knows teachers will have to complete a detailed portfolio to apply for a premium; if qualified teachers are turned down because of a shortage of money, Dickinson says that could hurt morale in his schools. Like many educators, however, Dickinson is quick to praise the state’s effort on the career ladder. While he has questions about the long term, he wants lawmakers to see their effort through. “Right now I think finishing the plan is a great approach,” he said.